Automotive awards are a joke. A cash-grabbing circle jerk where the “winner” often has the honor of paying the publication or organization serious money in order to use the name of that award in ads. Some automakers even have to pay upfront to get their cars considered. It’s a sham. The hustle gets even worse when you consider that the award juries themselves are frequently made up of the worst, free shrimp-hoarding shills who use their position on one of these panels to continue to get free cars and free trips even if they write for a publication with 12 readers. I’d call it extortion except the automakers probably benefit most. Being able to call yourself “The Official Convertible Crossover Of Lower Kentucky” is something you can brag about to your boss, and buying lunch for a couple of has-beens and dropping a couple of grand on an “entry fee” may be worth it. Just look at any recent Chevy ad. To make sure they don’t offend anyone, these organizations or magazines often give out multiple awards in so many categories everyone wins. It’s a joke. I have never met anyone who has purchased a car because it was the Motor Trend car of the year. Just look at this list of losers. Same for the 10Best or whatever. I’m sure these people exist, but I assume well out of proportion to the value automakers and publications put on these accolades. I came across a press release this week heralding the Dacia Duster Commercial 4x4 as the “Best 4x4 Car-derived Van” according to the VANSA2Z (which I originally read as VANSASS, an entirely different magazine but also predictably a British one) awards committee, made up of the British publication of the same name. This is an amazing award and a quick look at their Twitter account shows that they give out a lot of very specific awards to a lot of vans. Editor’s Choice! Diesel EcoVan of the year! 4x4 Panel van of the year! Founder and chairman of the Transit Van Owners Club, which he founded in 2005, Peter is a modest and generous man. To coincide with the Transit’s golden anniversary in 2015 he was the author of a definitive book — appropriately titled Ford Transit – Fifty Years — and announced that all the royalties would be donated to BEN, the automotive charity. A cheque for £1,000 was handed over during this year’s proceedings at Twickenham Stadium. 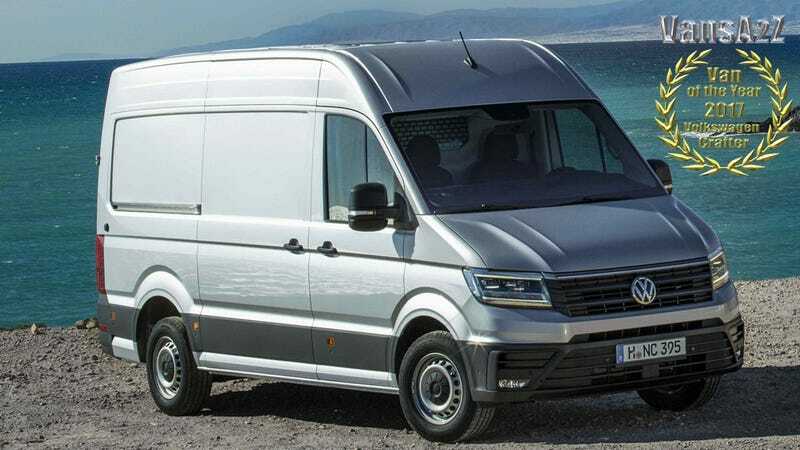 If you were curious, this year’s overall winner was the Volkswagen Crafter, one of the few European/Global vans not imported to the United States. To be fair, I cannot easily handicap whether or not VANSA2Z is totally above board or is perhaps playing the same game as their American counterparts. They do give an awful lot of awards that are highly promoted by the winners. But there’s something so delightfully British and perfectly detailed and kind of charmingly amateurish about it. Congrats Fuss Canter! Well said. So, take it from me, if you are in the market for a light commercial van you should definitely at least consider reading VANSA2Z. For anything else just read a bunch of different reviews or Consumer Reports.